The Kuvasz is well known as a Hungarian guard dog throughout Europe. Owners value the breed for its intelligence and ability to act independently while still remaining loyal and protective of family. Alongside their working aptitudes, they make for playful and affectionate companions. These dogs are a great addition to most families. These dogs are well known for their independent personality. This trait assisted them as guard dogs, as they had to make decisions on their own but it can make them a bit stubborn and difficult to train. A Kuvasz is extremely loyal but the first step is getting their attention. At the same time, the breed is sensitive to harsh treatment. The dog will not give its owner authority to treat it badly, and will instead become aggressive and aloof. These large guard dogs are gentle enough to be able to coexist with children. 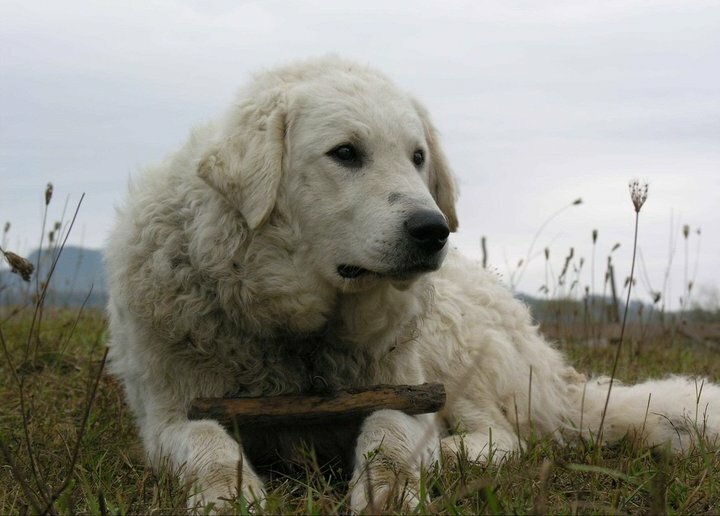 The Kuvasz is a playful dog, and will appreciate the additional company. Children must always know the dog’s boundaries before handling or playing with them. Small children are at risk of injury as well due to the breed’s size, which can knock them down quickly. While they are typically suspicious of most strangers, they are notably social with other canines, but not necessarily the best choice for families with other types of pets. Their intensity makes them more likely to injure smaller pets, although, they can be gentle and coexist with them, if socialized at a very young age. The Kuvasz is an independent dog and likes to explore and have a lot of space to run around in. This would be one breed that would not work well in an apartment. Rural settings are best. They tend to wander off, and thus, it is recommended that they have an enclosure when outside. They also like to chase off any encroaching wildlife, furthering the need for a fence. These dogs are tough, however, so a shock from an invisible fence may not suffice. The Kuvasz is also well known for its vocal personality. These dogs bark often, and loudly when they do. This assists them as a guard dog but is not too appreciated by neighbors. They are not suited for areas of high population density, whether it be wildlife or people, as it only gives them more things to bark at. These dogs are bursting with energy and prefer to spend their time working or playing. Kuvaszok (the plural form of Kuvasz) love being involved in family activities and being given a responsibility of their own. Their abundant energy also makes them need to get a lot of regular exercise. 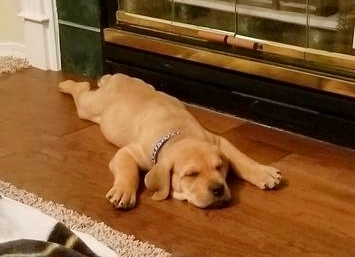 Along with keeping them healthy, exercise will decrease their energy, helping the dog relax. If they do not release their energy, they may begin indulging in some bad behavior, as a result. While they love to be with their owners and families, Kuvaszok handle themselves just fine when left alone. They are not prone to separation anxiety and are capable of remaining calm when left by themselves for prolonged periods of time. While they are not sensitive to loneliness, they are a bit sensitive to heat. Their thick coats make them overheat quickly, and they should be monitored carefully when the temperature rises. The breed history spans a very long time, as they are considered to be one of the oldest dog breeds in their home country of Hungary. These dogs likely arrived in the country along with invaders and later took root. The origin of the breed’s name has some speculation, but may come from the Turkish word for a bodyguard, “kawasz," which makes some think they are a Turkish breed, which they are not. Their name well suited their job in Hungary, as the dogs proved to be capable guard dogs. Their working abilities were widely recognized in the country. They saw special appreciation amongst the royalty and nobles of the country, and under the rule of King Mathias in Hungary, owning a Kuvasz became a fad. The king was very fond of the breed, especially its ability to protect him, and utilized this trait to his advantage, using the dogs as a fluffy royal guard. After Mathias’s rule, the dogs somewhat dropped off in popularity. They maintained a prominent presence in Hungary but were otherwise unknown. The breed would remain this way until the 1800s when breeders in Europe began to take a liking to these furry protectors. Newfound foreign interest in the breed would bring it back into the modern world during this time. Like most breeds, the Kuvasz’s rise to fame was interrupted by World War 1. The war effort was the priority in many countries in Europe. While the war was being fought, dog breeding and dog shows were put on the back-burner. Some breeds were significantly affected by the war, losing chunks of their population, some going extinct altogether. World War 2 put the Kuvaszok at even greater risk than before. The majority of the breed died out or was killed during these years and following them. By the end of the war, few of these dogs remained alive. The gene pool was ravaged by the conflict, and very few could afford to keep large breeds such as this. The Hungarian uprising did not help with these poor numbers and any attempts to keep the breed alive depended on imports from other countries. After such a dire post-war situation, the breed has made a steady return to stability. The population of the Kuvasz is back to a healthy level but remains mostly in Hungary. The breed failed to take refuge in the US, and instead, spread out into the rest of Europe. Today, they are slowly growing in popularity and population in other countries. The Kuvasz was first recognized by the AKC in 1931, as it would not be heavily endangered until WW2. Today, the breed remains unknown, holding the ranking of 155th most popular breed in the US. The Kuvasz presents difficulty when beginning training, but is an easily trainable dog altogether. Their independent personalities make them reluctant to train if they notice a weakness in their owner. If their owners do not assume the role as leader, they will, and become stubborn as a result. At the same time, these dogs are sensitive to harsh treatment so scolding bad behavior won’t help either. Once an owner has commanded the respect of a Kuvasz, it is smooth sailing there on out. These dogs are intelligent, capable of picking up new commands with ease. They become alert, responsive, and loyal dogs, making the consistent positive reinforcement worthwhile. The breed itself usually takes longer to mature. However, an adult Kuvasz proves to be an excellent companion. It is necessary to expose a dog to many sights, sounds and smells early on. Early exposure will make the dog less anxious and suspicious of things that seem unusual to them. Socialization is another important step in training any dog. Socializing a dog with other pets and people, whether it be on a walk or in an obedience class, will help the dog become more comfortable and social around others. The Kuvasz was traditionally used in Hungary as a herding and guard dog, so the breed has had some experience. Their size is ideal, as their strong physical build and heavier weight sound a warning for would-be intruders. The dog is capable of knocking down an intruder and holds an intimidation factor that might make them think twice about entering. This breed is ideal for guarding you, your family, and your property. The Kuvasz has the personality to be a guard dog as well. They are defensive of their home and incredibly loyal. They are naturally suspicious of strangers, and this makes them seem aloof around guests. At the same time, these dogs are capable of being social, while maintaining their suspicions. These dogs are alert, and fairly vocal about anything that seems out of place to them. They are capable watchdogs in this way, able to alert their owners with their booming barks. The tricky part is making the distinction between a stranger and a threat, both of which this breed will alert you to. There is only one coat color recognized by the AKC for this breed: white. There are no markings recognized by the AKC for the Kuvasz. The Kuvasz does not pose much difficulty when it comes to grooming, although their coat requires regular maintenance. Their thick coat sheds year round, and should be brushed a couple times a week to prevent it from matting, as well as remove shed hair. This breed is not very odorous, and their coat repels dirt and water, keeping them generally clean looking and smelling. They typically do not require frequent bathing, and should be bathed as needed. The grooming process usually covers the whole body, and that includes the paws. Like all breeds, these dogs need their nails regularly clipped. If a dog’s nails become too long, they can become uncomfortable, and even painful. A good way to tell when a dog’s nails are too long is by listening for the dog’s nails clicking against the ground as they move. If you hear clicking on your floors, it may be time to break out the clippers. These dogs usually need their nails clipped every 2 or 3 weeks. 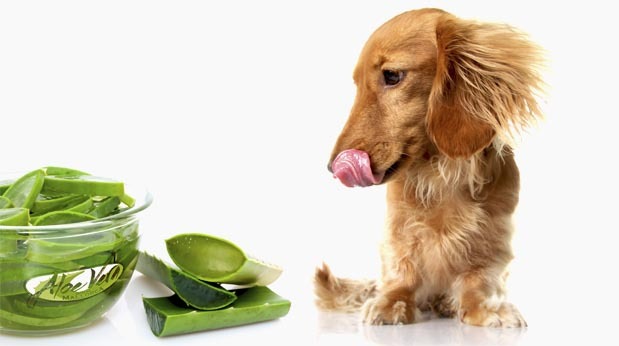 These dogs need their teeth often brushed, as well as their coat. Regular brushing helps remove plaque, prevent tartar buildup, and keeps the dog’s breath fresh. If not provided the proper dental care, they are in danger of mouth infections, cavities, and etc. It is recommended that they have their teeth brushed at least 2-3 times a week. 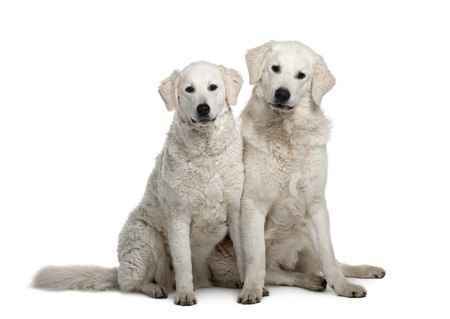 The breed’s large, down hanging ears, make it easier for a Kuvasz to get an ear infection. There is little airflow in the canals, which can become hosts to bacteria. Regular ear cleaning will help remove excess wax and bacteria that has built up in the dog’s ears. It is recommended that these dogs have their ears cleaned at least once a week. Like people, dogs can get sick, and be affected by a variety of health issues. Some breeds are more prone to certain health conditions than others. People should be aware of the health problems associated with a breed when purchasing a dog, as well as be able to provide full health care for them. Bloat (Gastric dilation-volvulus) A life-threatening emergency where the stomach distends with gas and fluid and the rotates on its long axis; This is seen in large breed dogs. Osteochondritis Dissecans: One of several forms of elbow dysplasia that can affect predominately large breed dogs. Progressive Retinal Atrophy (PRA): A Genetically inherited that cause a slow degeneration of the retina leading to blindness. Hip Dysplasia: This problem is seen in almost all dog breeds but more prevalent in large breed dogs. It results from the failure of the hip joint to develop properly. It is always important when buying a dog, to make sure that you purchase them from a reputable breeder. A good breeder will know the breed inside and out, as well as be able to pass health checks for their dogs. There is a DNA test for PRA and good breeders will screen their parent dogs before using them for breeding. Ask a potential breeder if they have hips evaluated. Elbows should also be checked before breeding.